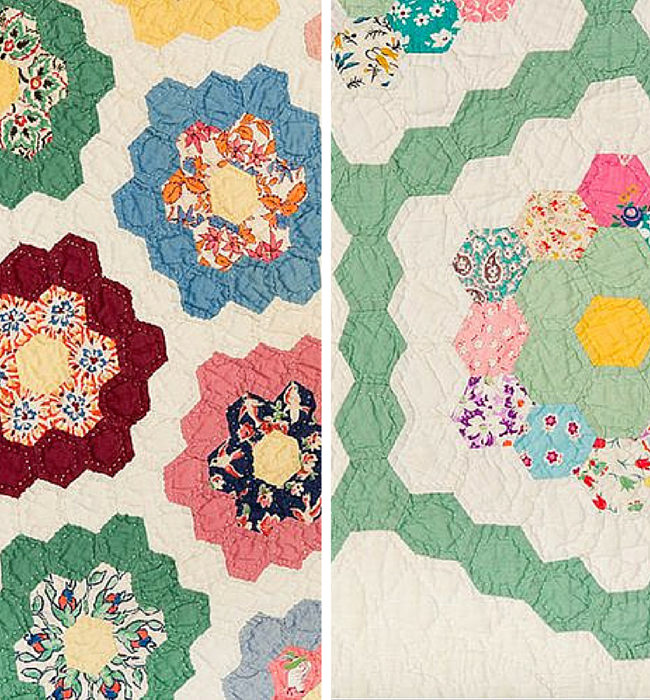 An English paper pieced Grandmother's Flower Garden quilt has always been on my sewing bucket list. So I decided 17 weeks ago (thanks Instagram!) I would start a proper one. I sprained my ankle quite badly a few months back so I was completely laid up for a few days, so what better way to pass the time than a new EPP project! 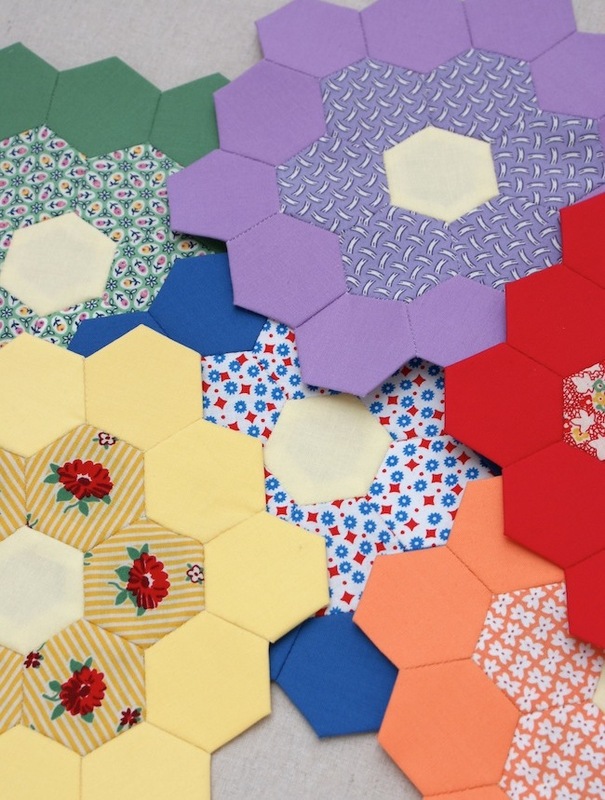 I've made tons of other hexagon flower blocks and different projects but I've not had a plan with them so they most often just end up stacked in my sewing room somewhere. Though with these flowers, I've had a plan. 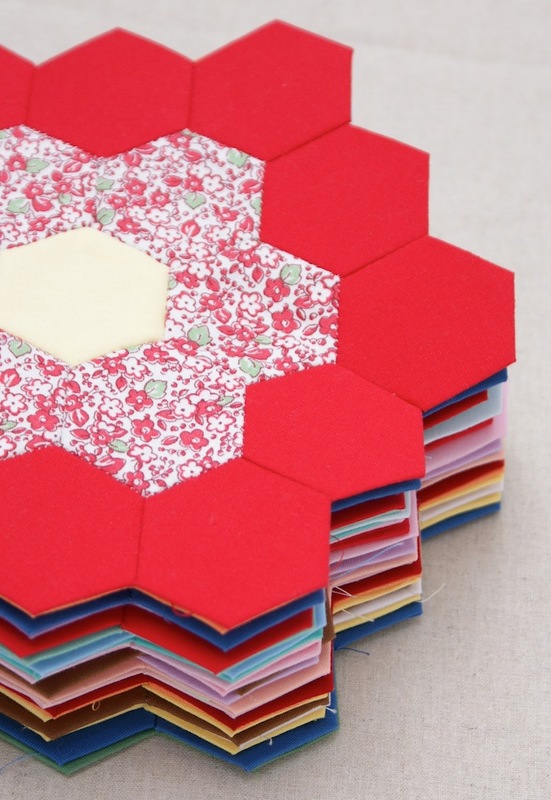 That plan being to simply use 1" Hexagons English paper pieces. Kona Solids for the outer ring, a matching print for the inner ring and a yellow centre. A truely classic quilt. My favourite kind. I'm 25 down, which is pretty good going considering I haven't worked on this for weeks and weeks as I've been working on a bunch of other English paper pieced projects. 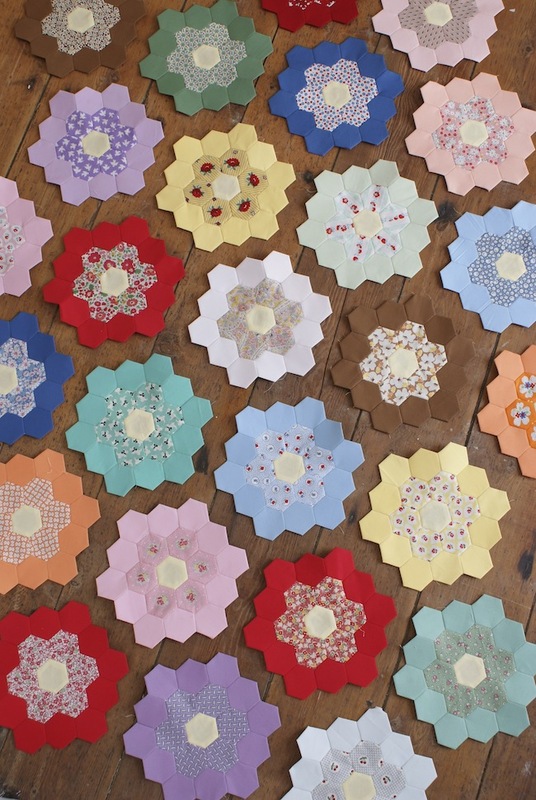 I'm not sure about the 'garden path' which will join the hexagon flower blocks, White? Snow? Perhaps another ring in a soft green, like this one on the right? I'm also considering mixing up different colour solid and printed fabrics within each flower block, as the one on the left (which you might remember seeing from my English Paper Piecing Basics series last summer - because I'm head over heels in love with it!). This is taking a backseat at the moment whilst I prepare for Festival Of Quilts this August, yikes did someone say it's less than two months away now! Deep breaths... I'm at stand F5 remember ;-) But this relaxing project will be right back up the list once I'm back on track. For now, it's a start. MMMMMM, perfect deliciousness. Please share progress. Love your fowers to date. GFG is on my to-do list, but probably win run out of tim! But I have wondered if what the rusult might be if, in a deisgn like yours is, I could meander a changed coloured path, or might it look too irregular? Like from pale green through to a darker green, or in pockets of darker green 'foliage' around some flowers for example? This is where you need a fancy software prog to show what you end up with I guess. I may yet try it with half inch hexis to get an idea though. Your flowers look delightful, look forward to seeing what colour path you opt for! 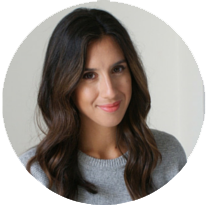 Your blocks look so lovely, a real 1920's/30's feel! absolutely beautiful!! i have some EPP flowers too and no plan, so i am excited to see what you do! !